In a domino-effect due to recent raids on recycling funds, supermarket recycling centers and other Buy Back Centers are closing statewide. It’s a hard time for recyclers and for consumers looking to get their nickel back for their used cans and bottles. Thankfully, for Santa Barbara at least, MarBorg waste management company pledges to weather the storm. 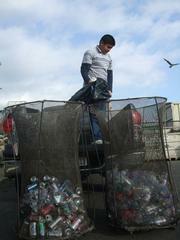 The Bottle Bill (AB 2020) was established in California in 1986. Under its terms, a CRV (container redemption value), usually a nickel, is included in the price of plastic and glass bottles. Consumers can then redeem their five-cent deposit by returning their empty containers to supermarket-based recycling centers, or other official Buy Back Centers, or they can donate it to a nonprofit recycling program. Consumers who drop off their containers in blue bins of curbside recycling programs are supporting those programs, as their CRV goes to the maintenance of that curbside program. 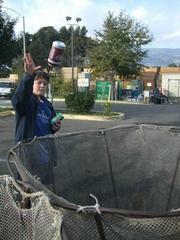 Consumers have, for years, been able to redeem used cans like these at recycling centers for a small amount of money. The nickels that go “unredeemed” by the consumer are collected, by the Department of Conservation, into a fund that supports the convenient supermarket-based centers and other supplemental recycling programs. It’s a social contract: If the consumer pays a deposit on beverage containers, he or she will be able to refund it or donate it at a convenient location. California’s recycling rate for containers has gone up from 60 percent to the current 85 percent in just four years, but what seems a fortunate statistic has unfortunate results for the Bottle Bill fund. It is perverse economics: The more successful the program, the less money it makes—money which is needed to sustain convenient recycling locations. Additionally, the scrap price of aluminum has gone down, which also contributes to the depletion of the Bottle Bill fund. Santa Barbara residents, like this young man, will still be able to drop of recyclables at Marborg's Buy Back Centers despite the statewide closure. Recently, though, the fund has taken another, potentially fatal hit—this time from the California government. Authorizing a “loan” to the state’s general fund, Governor Schwarzenegger depleted the remaining $200 million recycling fund by $132 million, practically wiping out the recycling fund and recycling Buy Back Centers with it. There are over 2100 recycling centers in California, but already, since Jan ‘09, more than 60 recycling of them have closed their doors. “That number,” says Evan Edgar, principal engineer of the California Refuse Recycling Council, “can quickly and easily double,” resulting in lost jobs and less convenience. It’s a rough, rough time for recycling companies, and many California consumers looking to conveniently refund their CRV may be simply out of luck. A social contract has been breached. But not in Santa Barbara. MarBorg waste management company refuses to close its Buy Back Centers. Because MarBorg deals with all waste—green waste, recyclables, and hazardous household waste—the company can afford to keep its Buy Back Centers open, even though MarBorg doesn’t profit from them. "There is no money in operating Buy Back Centers," Mario Borgatello of MarBorg commented. "We operate two centers purely for the convenience of our customers." Social and community considerations were reportedly a large factor in the decision to keep the area buy back centers open. “Mario is staying open because he understands the social contract,” Edgar elaborated, and can accommodate a recycling center because of the other services Marborg offers. MarBorg’s commitment to recycling and the consumer comes as a relief to the many who visit MarBorg’s Buy Back Centers: Before 3 p.m. this past Saturday, December 5, already 150 people had received their refunds on their bags of containers from the center at 20 David Love Place.